Here I am in Rockhampton. In Depot Hill. A good old fashioned working class suburb (Rockhampton’s like that). Beautiful day. Lots of birdsong. Tomorrow I fit out Peace Trike with a new display poster (a pale echo of Peace Bus). The goal is to embed a central concept of rational peace aspirations… that we disconnect from the empire’s military command. I’m working toward an “Independence from America” declaration on 4 July 2013 – just before TS13 assembles. Along the way I want discussion around Remembrance Day, ANAZAC Day, and the Coral Sea memorial. So that by the time of TS13 people are asking “why do we fight around the world for these bullies”? “EMMA ALBERICI: Major John Cantwell, on Afghanistan you write of being haunted by the lives lost there. The Government for its part says though there’ve been many achievements in Afghanistan – life expectancy up by five years to 48, many more children in schools, the people generally enjoying greater freedoms than they did in 2001. In your view, have those gains at all been worth the painful losses for Australia? 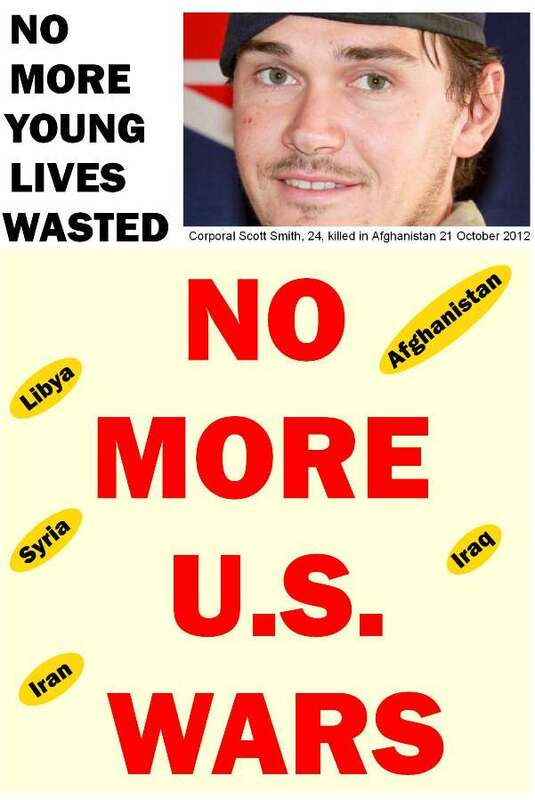 Is it right and reasonable for young Australians to be dying to defend American prestige?